It’s only March, and it’s already been an action-packed year for the Google Cloud Certified program. We kicked off 2019 by adding four new certifications to our portfolio, bringing the total to seven to cover the range of expertise that exists in cloud today. We developed these certifications to help you move your career forward and show off your cloud knowledge, especially as cloud computing continues to grow. Being Google Cloud Certified lets you prove and validate your knowledge in designing, developing, managing and administering app infrastructure and data solutions on Google Cloud Platform (GCP). Why get Google Cloud Certified? Google Cloud certifications are designed to help you validate your knowledge and make your cloud skills official. We have both Associate- and Professional-level exams to match the variety of cloud jobs. We also got exciting news recently that the Global Knowledge 2019 IT Skills and Salary survey ranked our Professional Cloud Architect as the top-paying certification. 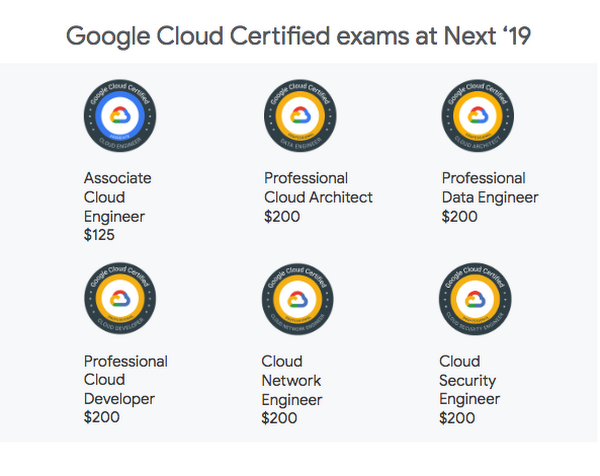 Being certified has its benefits, and if you’re already Google Cloud Certified you’ll find some great perks at Next ‘19. Our certified community will receive special recognition for their expertise: exclusive swag and access to the certification lounge, which is in the Expo near the Dev Zone entrance. And if you take a Google Cloud Certified exam at Next, we’ll provide you with exclusive swag and access to the certification lounge where you can recharge, replenish, and network. Testing is located at Bespoke in the Westfield San Francisco Centre, just a short walk from the Moscone Center. You’ll enter at 846 Mission Street via Bloomingdale’s, then head to Level 4 under the dome. Visit our website to get all the information on our exams. Review the Path to Success for the certification you choose. You can see the training options, including on-demand or instructor-led training, and hands-on labs. Take the online practice exam (available for some of the certifications). It’s free of charge and you can take it as many times as you’d like. Draw on your own experience! Your day-to-day experience in GCP is a huge source of knowledge, and the exams feature case studies to reflect the real world of cloud professionals. If you prefer instruction from a Google expert, we offer bootcamps at Next ‘19. Prepare for the Associate Cloud Engineer, Professional Cloud Architect or Data Engineer exams, or hone your skills in another one of our deep-dive technology sessions. Once you’ve registered for Next ’19, you can then sign up to take an exam. We’ll be cheering you on!